The small khaki Safari Photo Vest from CampCo is a 100% cotton vest that has 21 pockets, ranging in size from pen sized to oversized. The vented back and mesh liner allow free movement of air around the body. The snap epaulets will keep the camera, binoculars, or tote bag straps on the shoulder. The vest has a heavy-duty zipper that will close the entire front. It also has a single snap closure for the front and two snap adjustments for the sides. The vest is built oversized to accommodate fully filled pockets. 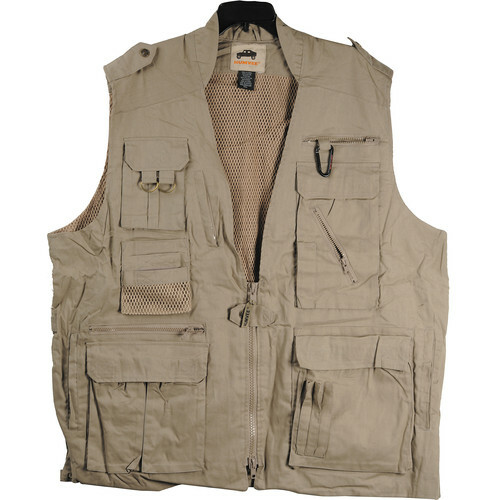 The Safari vest has a large pocket at the bottom back with two snaps; inside there is a large lined pocket that will keep sweat or rain from dampening papers. There are slash pockets on either side of the vest. On the right side from the top down, a shirt sized, bellows pocket with "hook & loop" fastening with two 'D' rings and a vertical zipper pocket with water resistant lining. A set of three pockets, one over the other with the smallest being net is closed with a "hook & clamp" loop, suitable for film or batteries, filters, lenses etc. One zipper pocket with a ring and snap for keys. Size 1/2 Chest = 22"
Box Dimensions (LxWxH) 16.2 x 10.7 x 2.2"
Safari Photo Vest (Small, Khaki) is rated 4.3 out of 5 by 63. Rated 4 out of 5 by Weekend Photo Warrior from Great Vest Really great vest for field photographers. I am not a large person, and when I put this vest on I look like I am swimming in it. But precisely because of the size, I can fit several large lenses with their hoods on in my pockets. I'm a girly type of girl, and at first I thought it was a little mannish, but it's actually not that bad. For me, it's WAY more comfortable to use this vest than to port all my stuff around in a backpack. The only thing I'd change is I'd like to see the adjustable snaps on either side of the waist have one or two more snaps for cinching at the waist. Other than that, it's perfect. Rated 3 out of 5 by Tom from OK for the money I have Domke Photog vest that is one size too large (works great in the winter over a down jacket). I wanted a smaller size vest for summer wear. The quality of this vest is half as good as the Domke, but the Domke is almost double the price. The Safari vest has lots of pockets but a few are too small for medium to large filters, so practically useless. The velco is stitched on but still appears a little weak. Just be careful and they should stay attached. If you want to save money then this vest should work reasonably well for light duty. Rated 5 out of 5 by Rainbowrider from Just what I expected I ordered small as the measurement requirements suggested.....The Campco Safari Photo Vest is just what I expected, perfect fit with plenty of pockets. And many of those lined to resist water. I can recommend this vest to anyone wanting value for their dollar. A great vest for any photographer. Rated 5 out of 5 by Reginalands from Photo vest that fits women! Women out there - have you noticed there's no such thing as a photo vest for us? Here's one that's proportioned for women (even though it is a man's vest). I'm a landscape photographer who shoots 4x5 film and this vest can hold three film holders in a series of stacked pockets. The cotton fabric is washable and may be treated with permethrin to repel ticks and mosquitos. The vest is also rather stylish. Rated 5 out of 5 by Diana from Great for luggage weight restrictions. I went on safari with a very strict weight restriction. Wearing my cameras, lenses, binoculars and other photo accessories on the puddle jumper flights made the restrictions a breeze. Also on the game drives its just easier to have everything on you without having to dig around a bag. Is this for women? What size for medium women? I would like to buy humvee jacket. Am bit confused wit the size! My chest size is 37.5 inches. . Which size ll suits me ? I'm sorry it has taken so long for me to answer, I was out of the country. I think the small will fit you just fine. You can also call and ask what the measurements are if you aren't sure. If it doesn't you can return it. I love this vest, it breathes well and is very comfortable. The pockets are really great too.